We headed out 6 hours to the Sands Expo in Las Vegas Nevada where we would make our visit to the 2017 Shot Show. We were very excited to make the rounds through this very large convention center that had 3 floors of Airgun and Firearm vendors. After a short walk we made our way into the Sands Expo where we checked in and proceeded to try navigating through the mass of foot traffic. 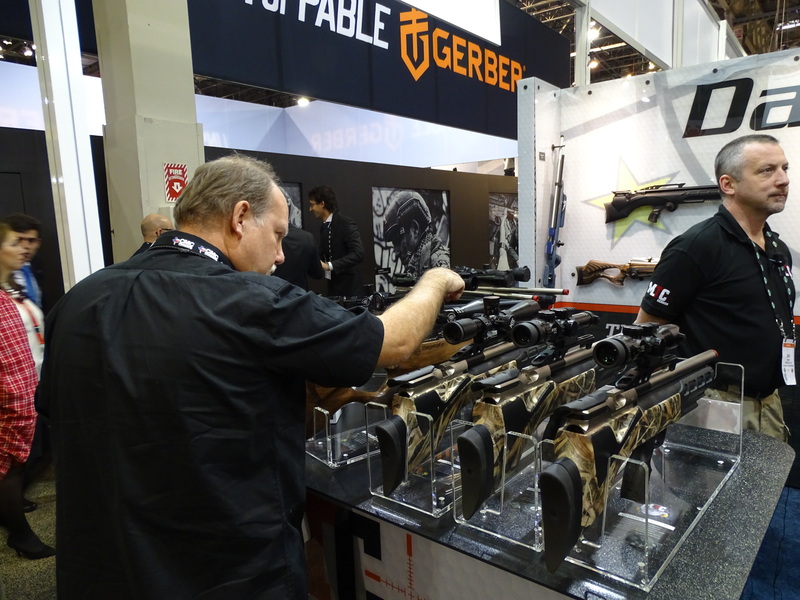 The amount of people attending this event was astounding, no doubt making it the most popular gun expo in the world. 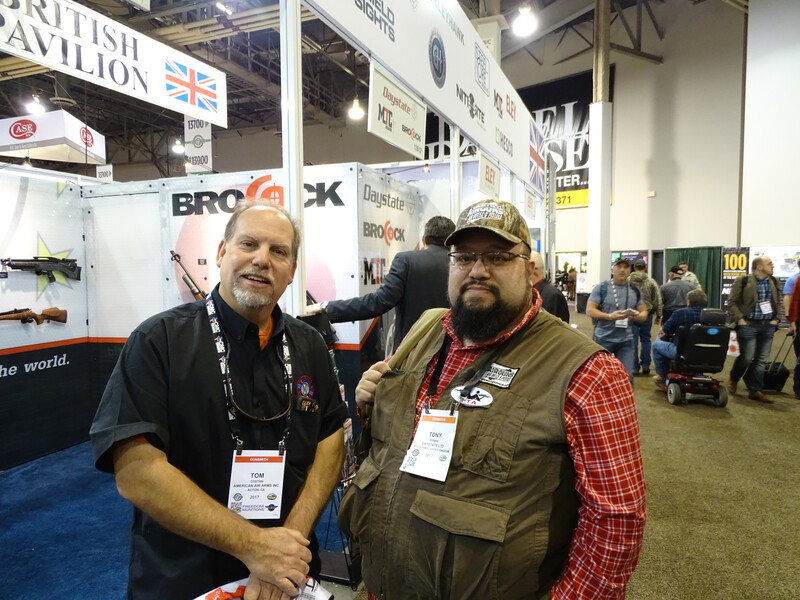 Our first stop was at the Airguns Of Arizona booth where we ran into Tony Roman from the popular site Airguns Air Rifles & Pistols as he was checking out few very cool products they carry. 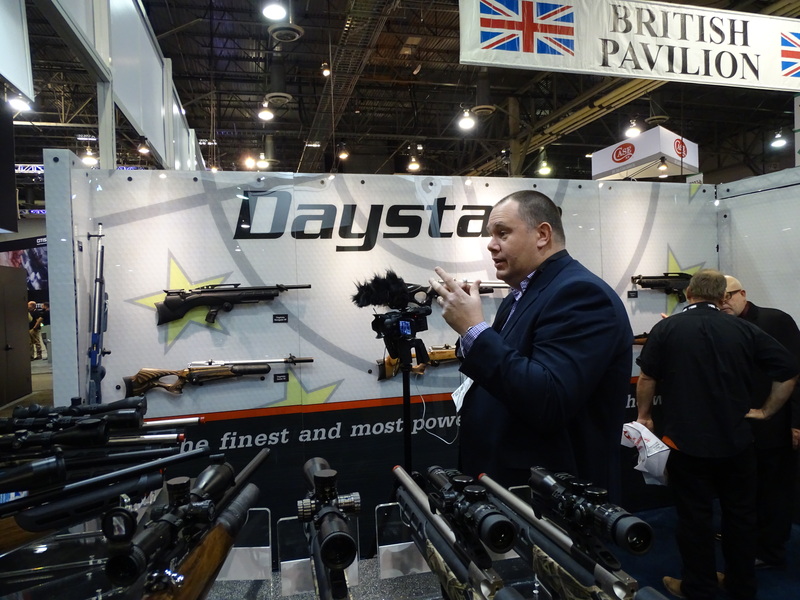 Some of the new Daystate models were no doubt in our opinion some of the nicest Airguns of the show as they even attracted some popular faces such as Giles Barry from the Airgun Gear Show. The Daystate rifles are very well made kits that offer quality beyond anything else we had seen. The wood stocks, fit and finish were absolutely top notch. Our next stop was over to the Crosman booth where we were kindly greeted by their friendly and knowledgeable staff that were happy to answer questions. 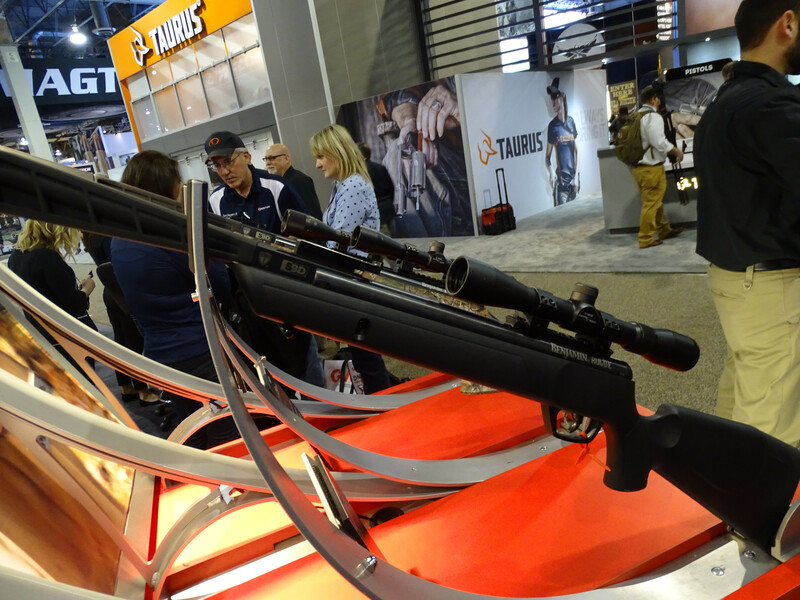 I spoke with them about several new rifles such as the Wildfire and the New regulated Marauder field target. 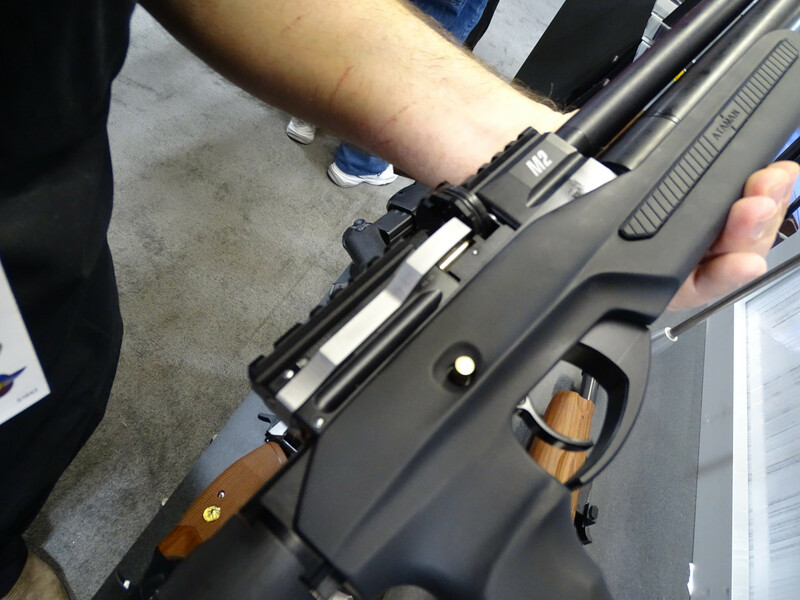 The Wildfire is essentially a PCP version of the 10/77 repeater that uses the same trigger and magazine system, but with the addition of a 2000 psi air reservoir. 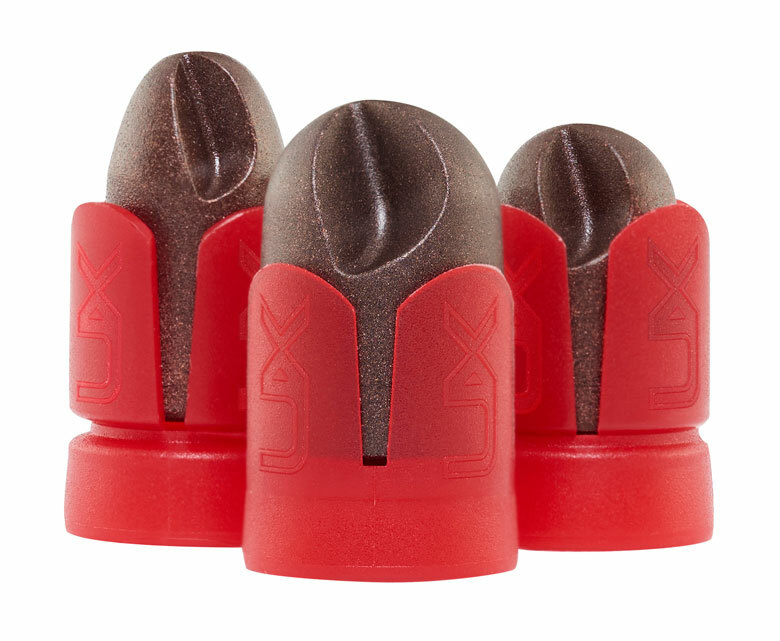 With a low fill up to 2000 psi it is perfect for those looking for a great gun to pair with a hand pump and at a reported 60 shots of .177 caliber pellets. The Wildfire is really going to be a good bridge gun that may bring PCPs into the mainstream market. 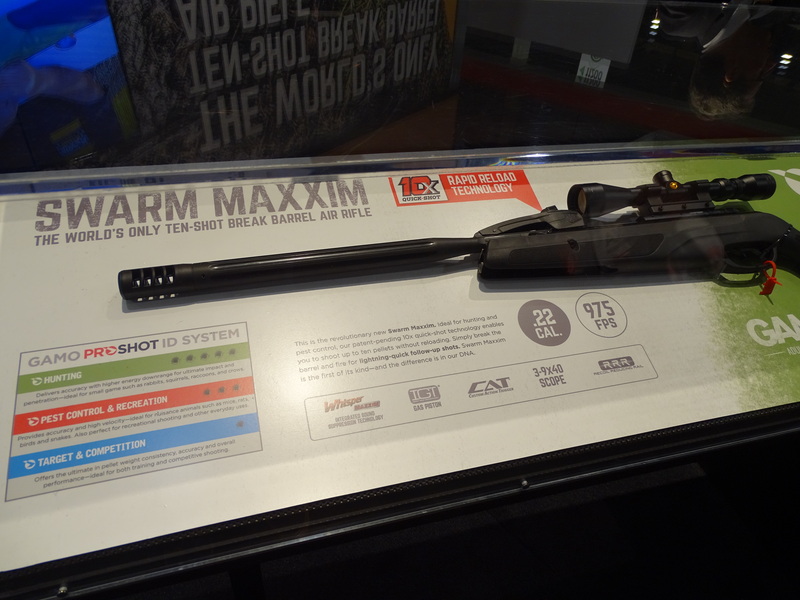 The SBD system is Crosman’s new silencer design, which allows for an oversize baffle and maximum volume in the chamber without obstructing the shooter’s field of view. This will be applied to all of the Gen3 Nitro Piston guns and we think the real reason for the design may have been to solve the cracking issues with the shroud on the older models. We really see no change in the performance of the gun by adding the SBD system other than cosmetics, strength and possibly sound of the break barrel. 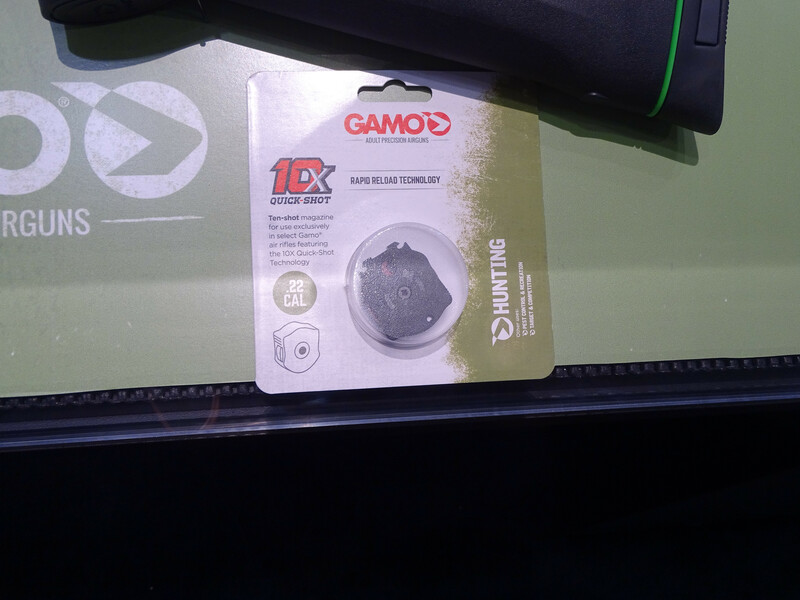 Our next stop was to the GAMO booth where we were a bit surprised to not be greeted by anyone, we did spy on the new Swarm Maxxim “repeating” break barrel though. 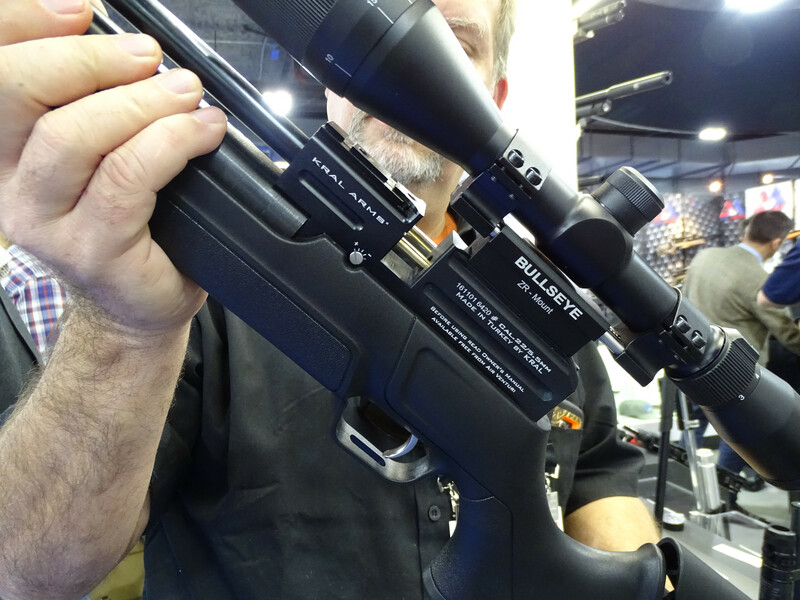 The rifle is a 10 shot repeater that uses a rotary magazine that’s inserted into a slot in the top of the rifle. Each time the rifle is cocked it indexes the magazine and loads the pellet into the breech. 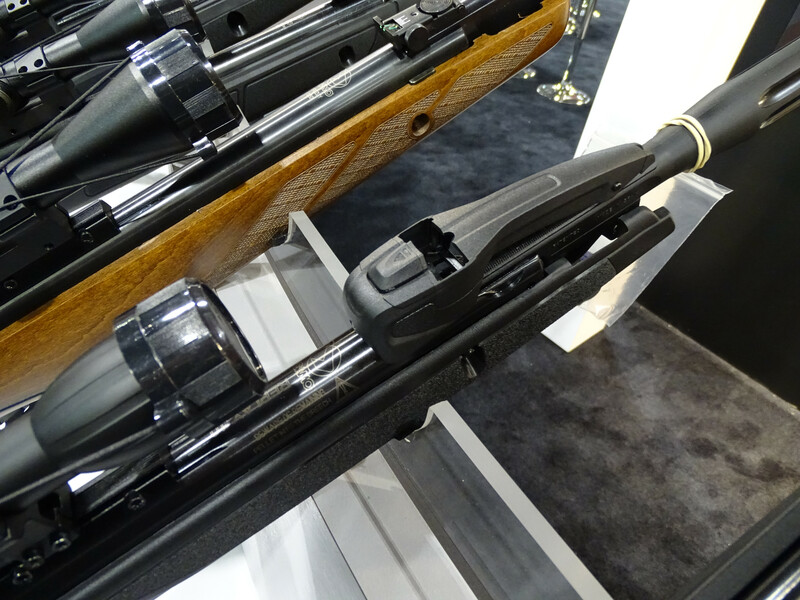 This is a great call by GAMO to create a repeating piston gun but would have loved to see it made as a side-lever design instead of a break barrel. 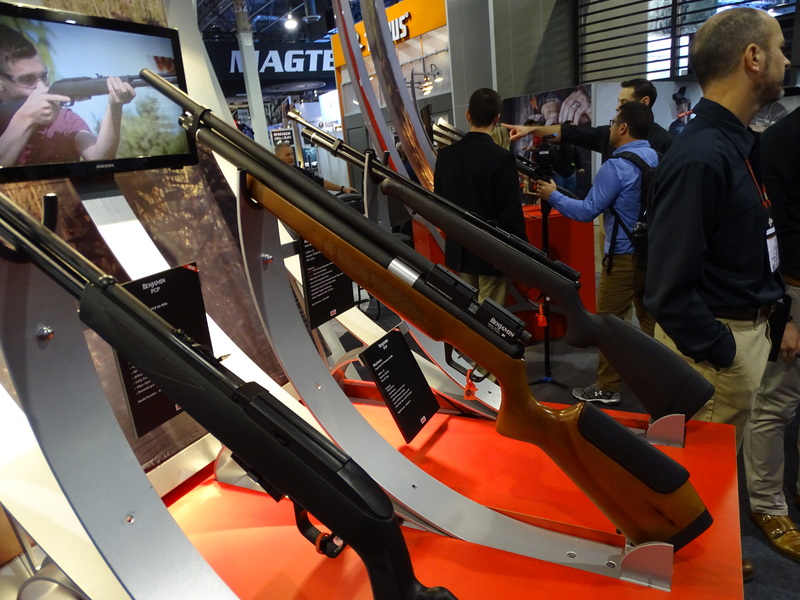 The rifle really isn’t much different than any of the other models as far as overall power or performance, the new barrel design is a bit robust and obviously resembles a large caliber center-fire rifle. 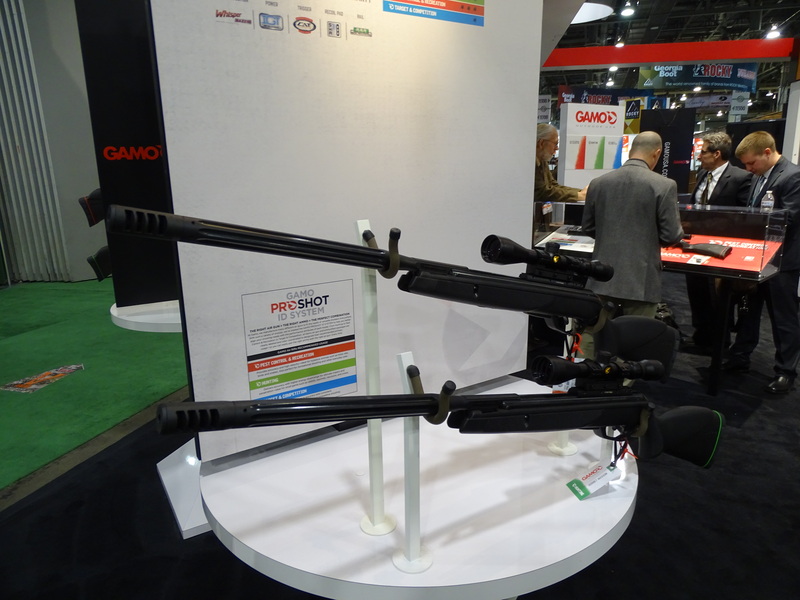 The great thing about the Shot Show is to see such a wide variety of Airguns and to find the good and bad in all of them. 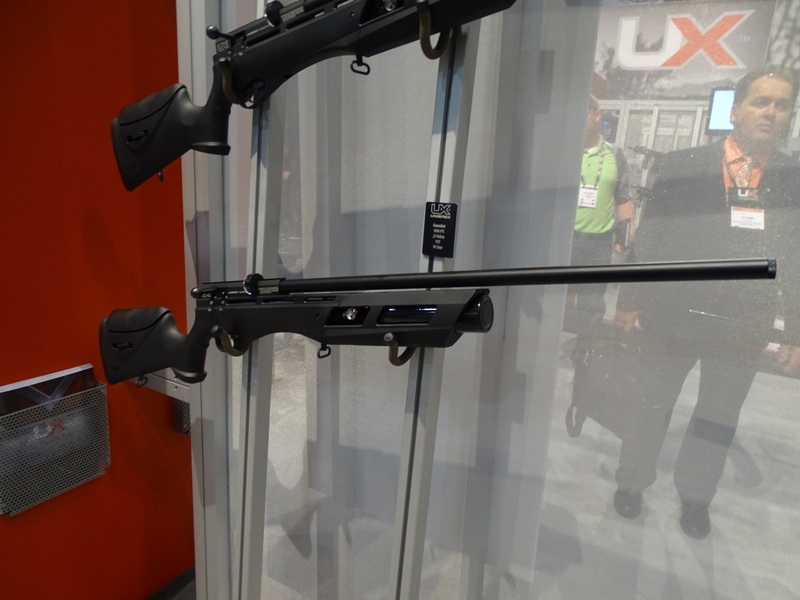 The next booth we visited was BEEMAN where we immediately drawn to the new QB-78S synthetic stock rifle. 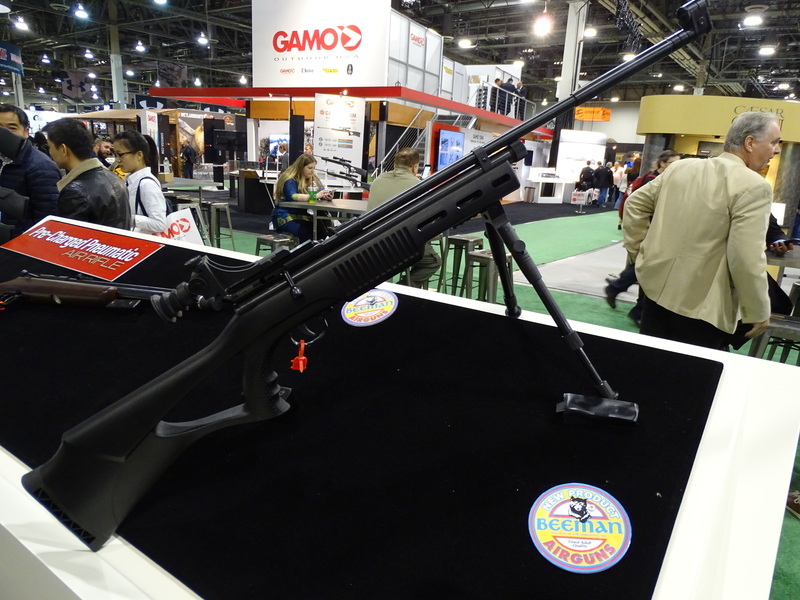 The QB-78S is an updated synthetic stock version that is designed to allow the use of a bipod, flashlight or laser. The gun is not changed other than the stock and may offer a little more versatility to some of you tinkerers. These QBs are great little guns for the money and no doubt will continue to be top sellers to the entry level and veteran Airgunners both. After a little more browsing we made out way to the EVANIX booth where we were kindly greeted by Siyoung Lee the managing director of EVANIX. He was happy to show us all of the great guns they had on hand including the new very lightweight semi-auto bullpup. 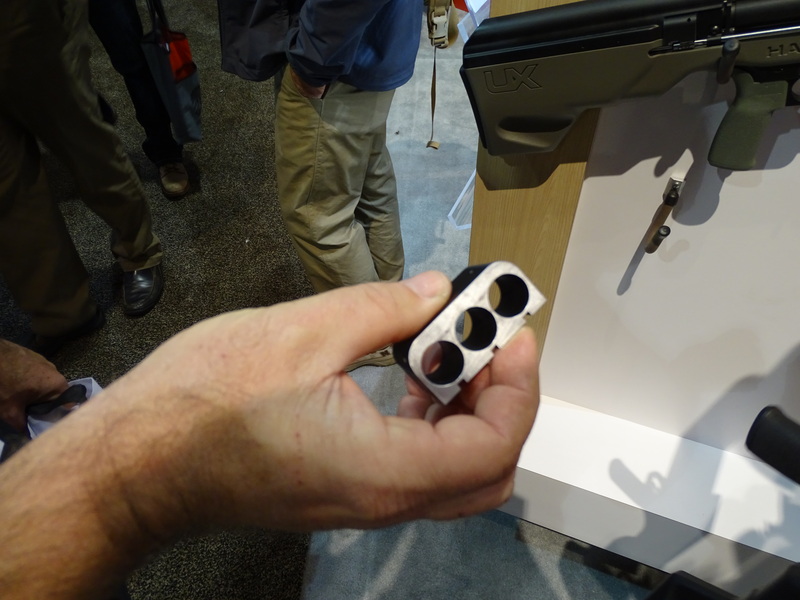 The new semi-auto models use recycled blowback to automatically cycle the magazine and load the pellet. 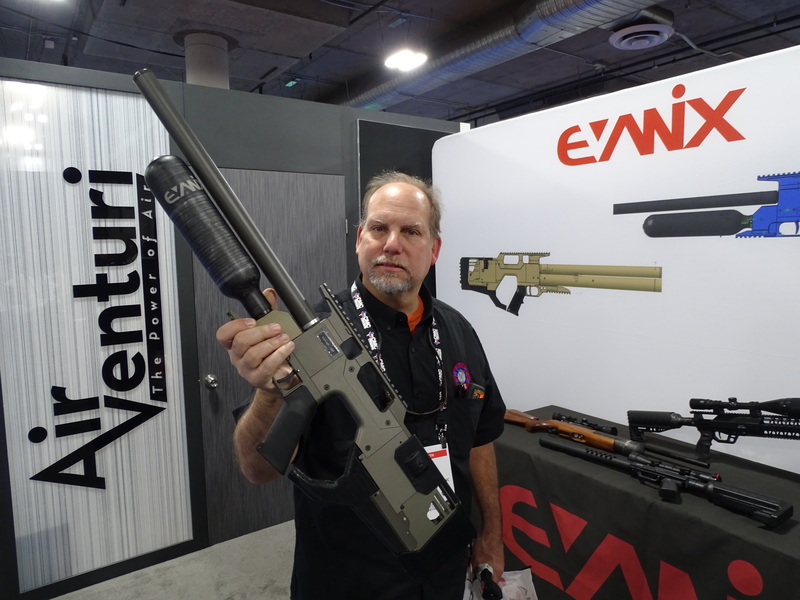 Evanix will be the first to incorporate recycled blowback into a modern tactical design. 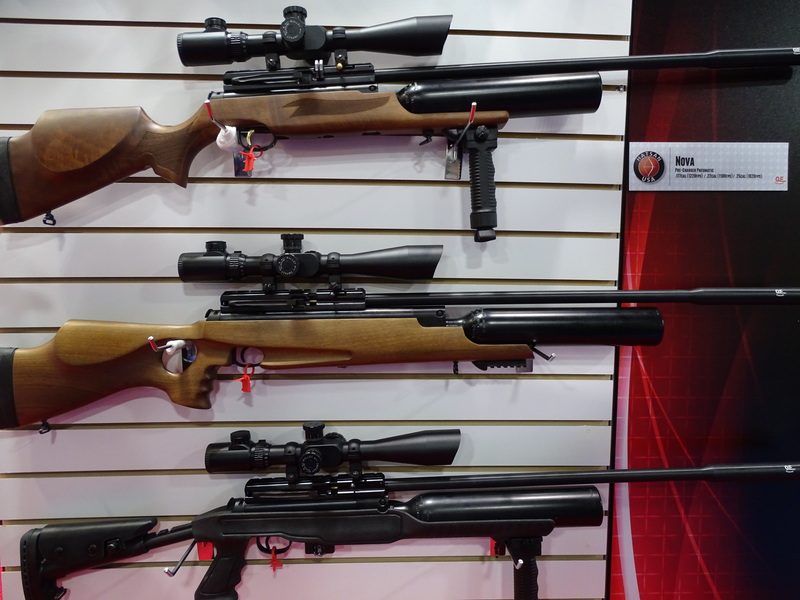 These new rifles are extremely lightweight and shoulder very well with great fit and finish. The innovation that goes into these guns is very advanced and no doubt is a stepping stone for many other companies in design. The REX pistol was a very neat little gun that looks to offer many features that any small game hunter would be really happy with. Overall I have to say that EVANIX has really hit the market this year with some serious innovative products that I think unfortunately were overlooked by a few other hypes. We however will have our eye on them and hope to report some further reviews down the road. Our next stop was a visit to see the new KRAL ARMS line of rifles that are newly imported from Turkey. These are the Puncher Breaker bullpups that are a bit crude in overall appearance but do offer some good features in .177/.22/.25 calibers. Some of the rifles are very sharp looking and the wood looks like fair quality for the price these rifles are going for. The one thing we noticed about the Puncher Pro model was its similar design cross between several guns such as Daystate, Evanix and Hatsan. The overall fit and finish of these guns is not super and feel like the want of comparing it to a very very nice Hatsan. The Puncher EVO does have some nice bling to it along with some very pretty wood stock designs. 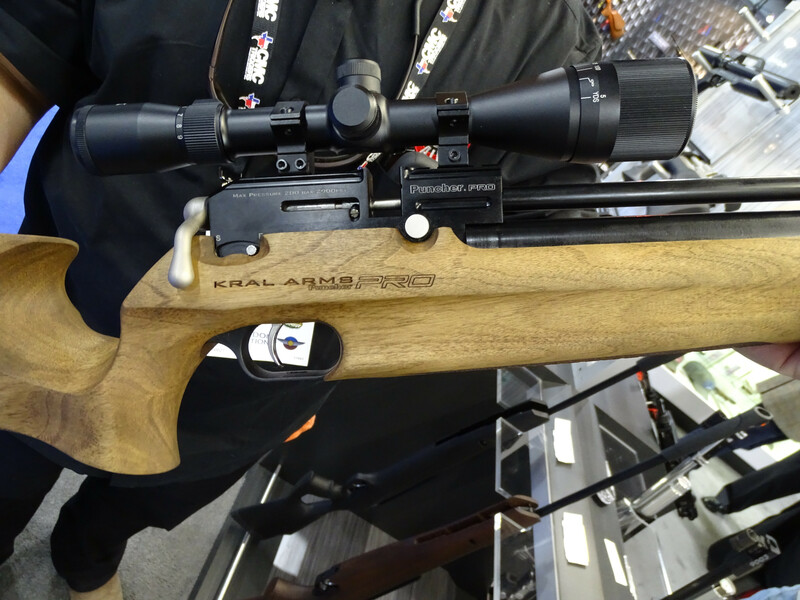 I think we will be seeing a ton of these rifles in the next year and can see Kral Arms being a great competitor to the Airgun market. 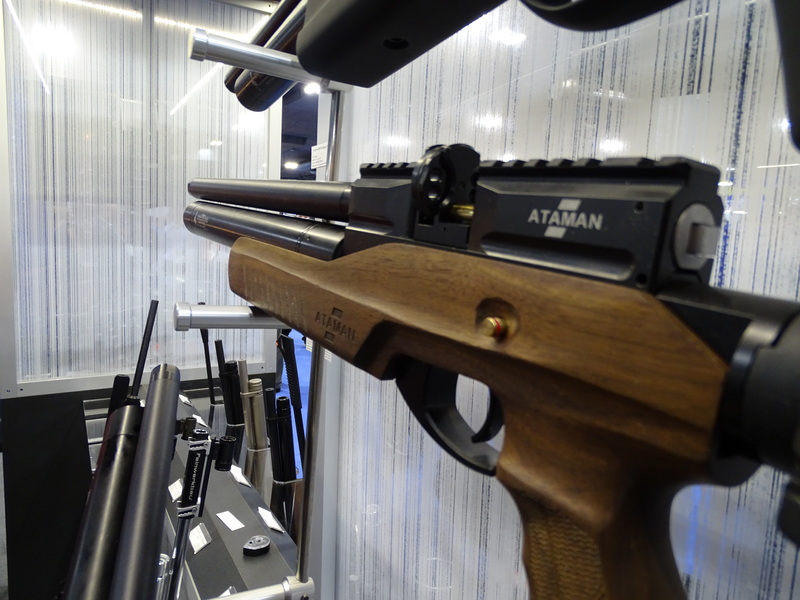 Our next stop was to check out the Ataman line of rifles that too have been a fairly new import from Russia. They were originally known for building high quality Olympic rifles and have carried the tradition of bringing some new age technology into these rifles. The M2R bullpups and compact rifles are pretty sharp looking and offer some fairly impressive performance. All the models offer built in picitany rails along with good sturdy stocks offered in wood and synthetic. The Ataman’s are high end guns but can see some improvement in making some of the edges a little less sharp. The side-levers and magazines are top notch and look as though they have been made to perform and last. These guns are hunters and have a great reputation for being built by the people who use them. 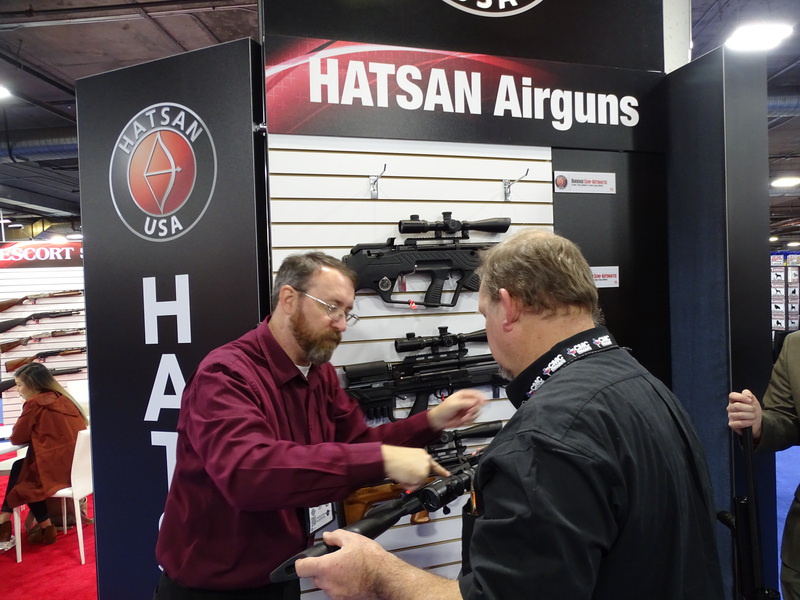 Our next stop was the Hatsan booth where we were very kindly greeted by the ever knowledgeable Cecil Bays from the popular YouTube channel AirGun Scout. Cecil was happy to show us several of the many new models and we were able to get all the information we needed from someone who uses every single model. 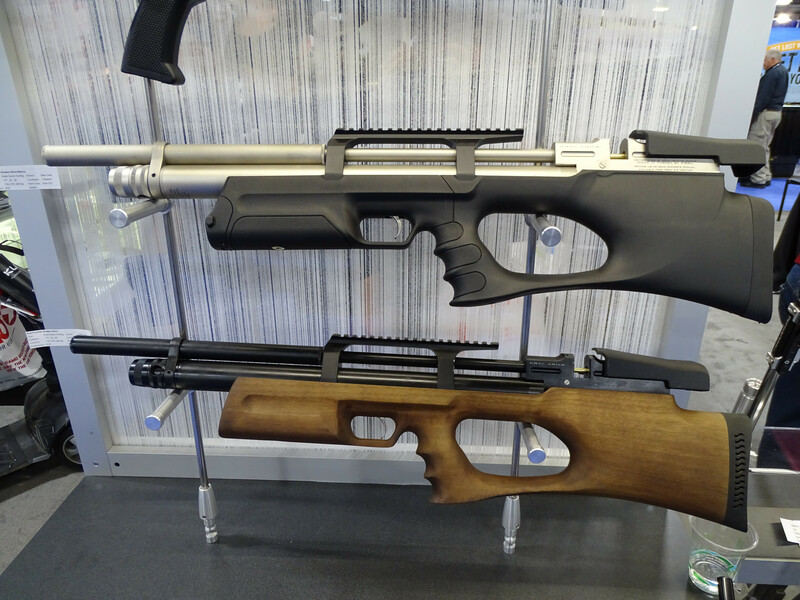 The newest model is the Bullmaster, a semi-auto bullpup that comes in .177 and .22 and has a 500cc bottle that offers a good amount of shots. The guns semi-auto operation is completely air operated and supposedly is a much more reliable and efficient way in design than some other kits offer. The gun is very heavy as much all Hatsan’s are, still we can give credit for some creativity in design. The new magazines are surprisingly very well made and all seemed to fit very well. The Nova may have been a favorite as far as looks but have to say that its very hard to get around the weight of these guns. We think Hatsan needs to lower the overall weight of these guns and spend some more time on the finished metal. Most of the guns were all very robust and had some design features that are really difficult to make sense of. 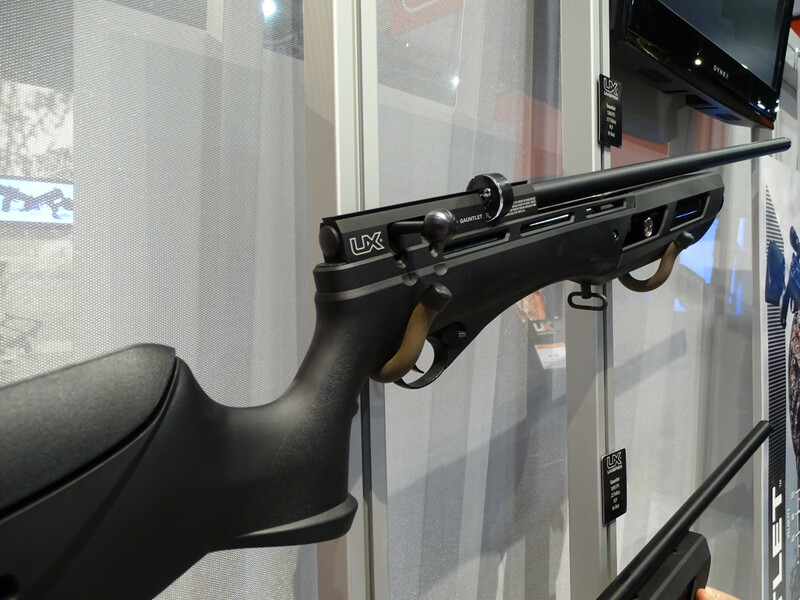 The fact that Hatsan is putting out so many new affordable models is great in the sense it offers something for almost any application. If Hatsan spent some more time on one rifle and raised the quality of the materials and QC we may see a huge step up because they do have the capability. Will they do it is the question? The next stop through our massive wave of people was the UMAREX booth where we planned to look at two new models that have really been turning some heads. The first gun we looked at was the Umarex Gauntlet entry level PCP that is planned to retail for $300, a great value for the money. The gun will be offered in .177 and .22 and features a 13-cu regulated Ninja bottle that fills to 3000psi and can easily be filled with a hand pump. They claim 60 shots at 900 fps in .22 and 70 shots in .177 at 1000 fps. The magazine is near identical to the Marauder and self indexes each time its cocked. The comb is adjustable that is a very nice feature along with a shrouded type barrel that is claimed to quiet the gun considerably. The only thing that would have made this gun better would be picitany rail instead of the dovetail. Overall this looks to be a winner of a rifle and tough to beat for the money. 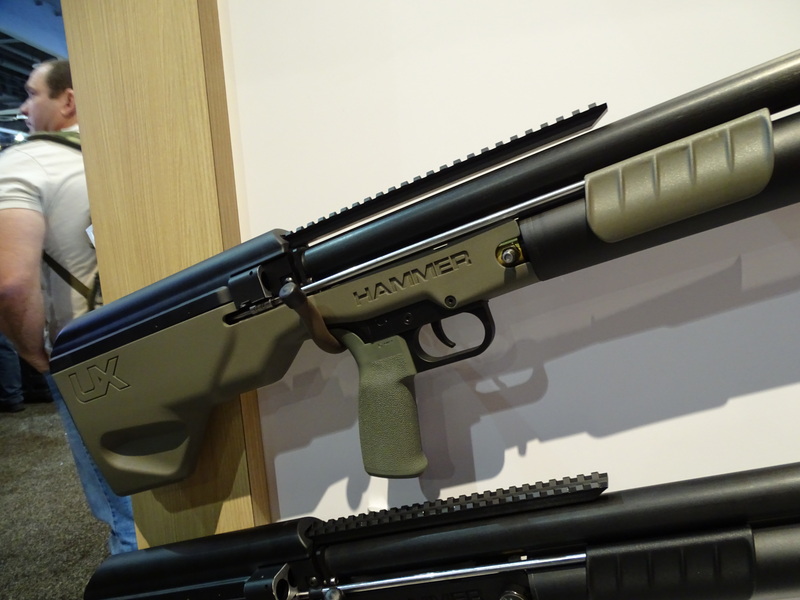 The next gun we looked at was the new .50 Hammer that is very boldly claimed to achieve 700 fpe in a 3 shot repeater “pump action”. This rifle is no doubt very innovative but still very skeptical to being able to achieve the power level claims. ” The Umarex Hammer is a 700 ft. lb. 50 caliber PCP rifle in a compact configuration that will shock airgun hunting enthusiasts with its innovative approach of packing multiple shots with lots of power into a modern and rugged rifle that’s easy to carry and use.” ?? We are definitely shocked. The gun uses a stripper type magazine that moves to the side to load each slug into the chamber. 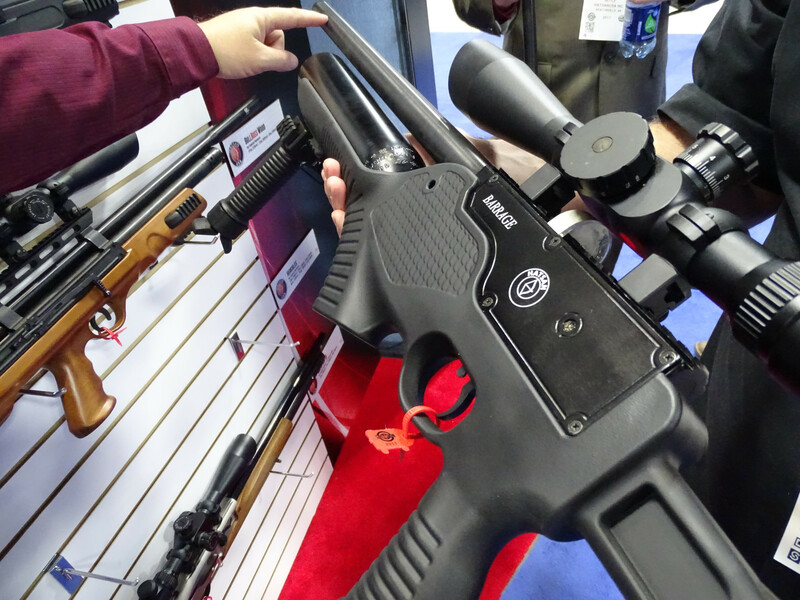 The gun was showcased with a new Umarex ARX ammo that is essentially a sabot type that’s popular in the muzzle-loading world. 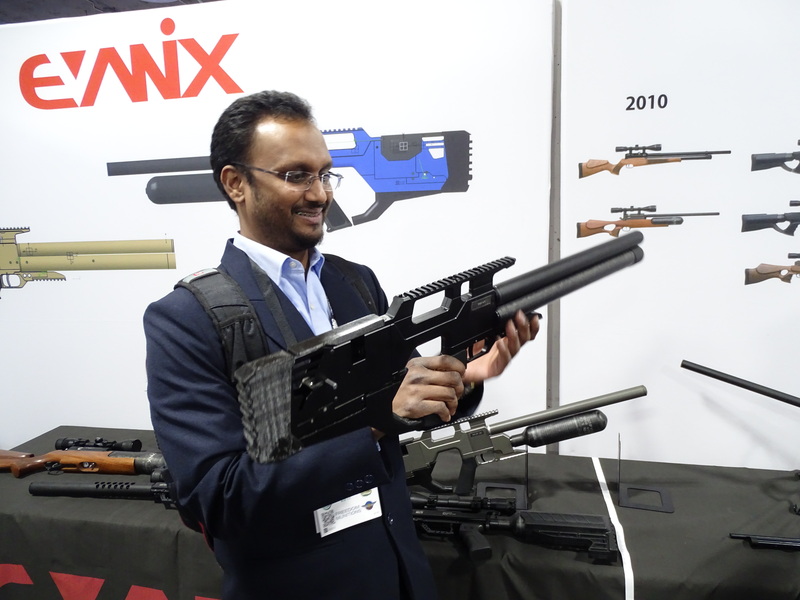 The Umarex staff was not able to answer many questions such as ammo weight or air capacity for this rifle. The barrel looked to be near 48″ long with some sort of carbon fiber sticker type wrap on it. 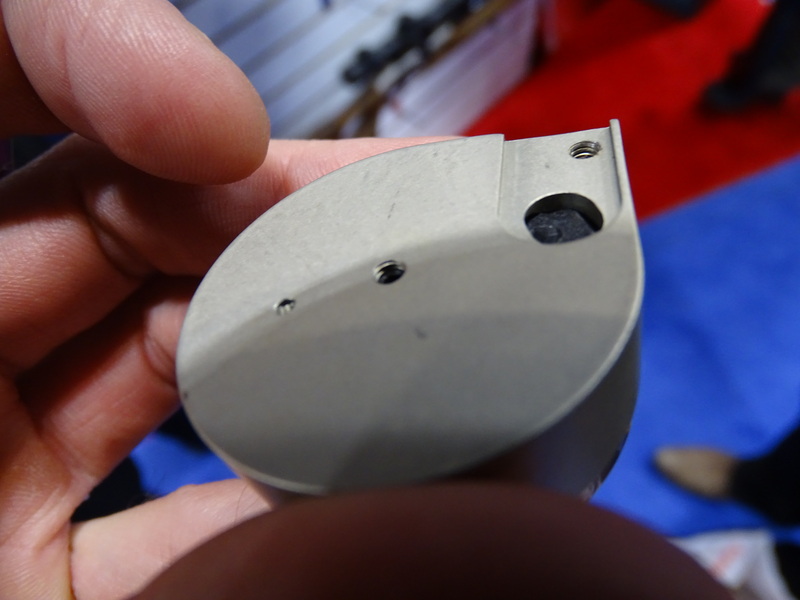 The thin walled, untensioned barrel may prove to be a serious problem with harmonics when producing 700 fpe. When asked about accuracy the quote was 2″ at 50 yards, good enough for a hunting gun?….The gun looks as though it may be using a large plenum that is housed somewhere near the back of the buttstock that may explain its ease of cocking. A heck of a hammer spring would normally be needed to put out such high numbers. The best guess is this gun may produce high numbers but with only one shot and several using a lightweight conservative slug. The gun does have a curb appeal that includes AR furniture, picitany rails and a fairly lightweight to it. Without seeing more than just a few prototypes we can really only speculate on weather or not the hype is all true or if its just a brilliant way to achieve some much needed publicity. Umarex did bring a good show and does look as though it has created a winner with the Gauntlet model. Our last visit of the day was to Predator International where we met and talked to Richard Dixon. Richard showed us a few of his new lead free GTO line of pellets that look as though they are a great step in lead free technology. We are a California based company where many of our hunting areas may soon require a lead free alternative due to changing laws. Predator International is on top of the game in providing exceptional products for hunting and target practice. 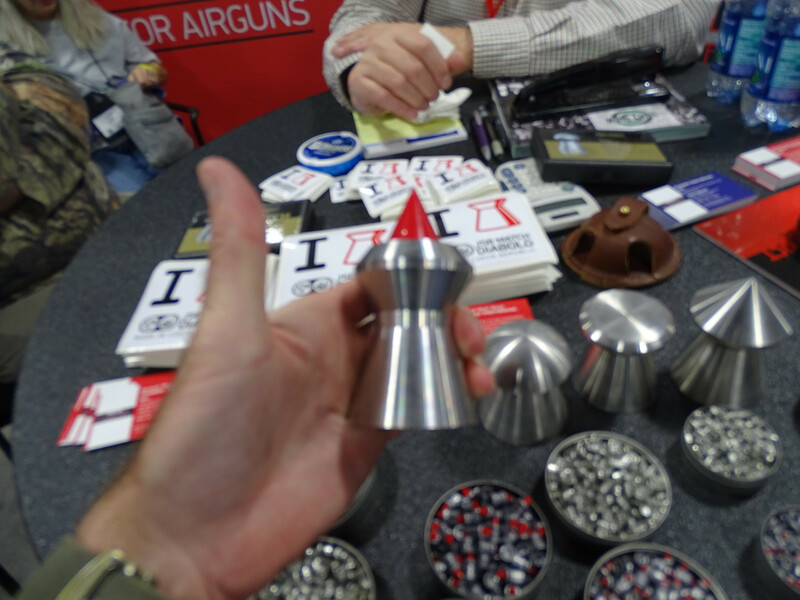 We helped ourselves to a few stickers and had a good chat with Randy over at RL Airgun Supply who seemed like a great guy who enjoyes the sport to its fullest. 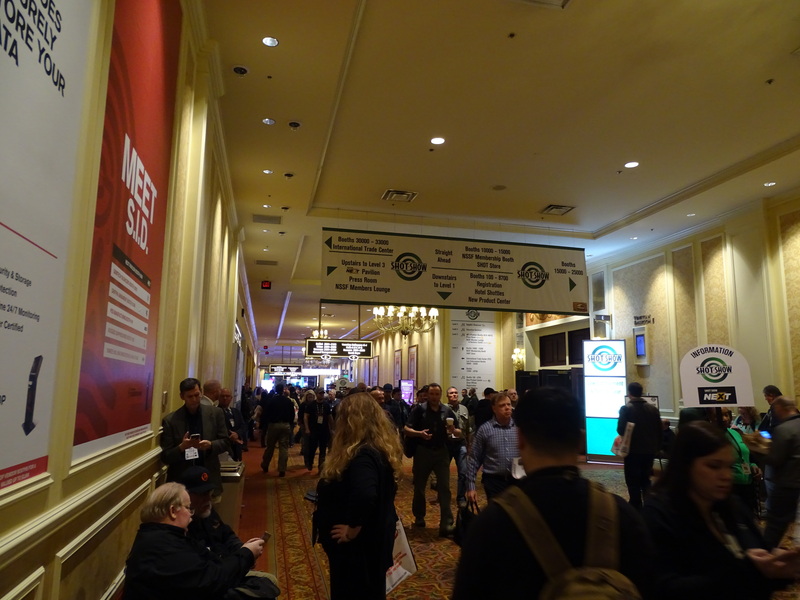 The 2017 Shot Show was a great visit and found it as a valuable tool in being able to interact with the companies on a more personal level and to see the faces behind the media that promotes them. The goal for this trip was to make some connections and to try to share some serious truth as to what was seen in the light. All that was mentioned is just our own opinion and applied using the best facts that could be gathered, hopefully it can be taken as helpful.